This is the most important season of our entire Liturgical Calendar…celebrating that Jesus rose from the dead…for our sin.. for each one of us! Although all the stores were packed with colorful eggs, little chicks and bunnies…we’re not just celebrating Spring this time of year! We’re looking for sustainable celebration for the whole season of Easter! 50 whole days! Remember all the activities for Advent?…particularly the Advent calendars counting down to Jesus’ Birthday with little treats and activities? The Easter Season calls for even MORE celebration, sustained throughout the 50 Days! DIY Catholic Kinder Surprises for the 50 Days of Easter! 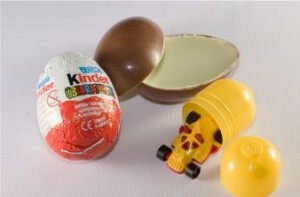 Since Kinder Surprise Eggs were banned from the USA (is this true? ), this is what they look like here in Canada. They are foil-wrapped chocolate (and milky-lined) eggs, each with a plastic popping egg inside. Inside the plastic egg, there is some sort of toy; some are ready-to-play and others are ready-to-assemble. These are pretty popular with my kids…and I thought it was a great opportunity to convert these little gems to be Catholic! You probably have a pile of recently emptied colorful plastic eggs for Easter, right? 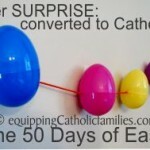 It’s not too late to fill them with cool stuff for the remaining 48 days of Easter! Celebrate the fullness of Easter…and make this Season more memorable for years to come! What kinds of surprises and treats will grab attention for those 50 eggs? Wouldn’t it be awesome if they could reflect our Easter Joy…and our Catholic Faith!? 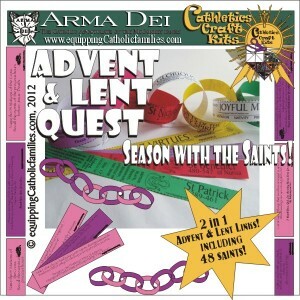 Maybe you purchased Advent and Lent Quest, but only used one strand of chain links this Lent (there are THREE sets!). 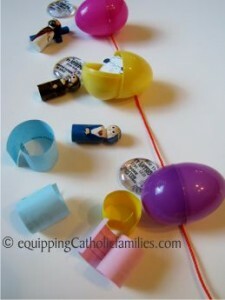 Consider rolling up a Saint link for each Easter Egg to celebrate a Saint of the Day in your own family way. Perhaps you have made your own set of Wooden Painted Saints? The small size peg I use fits easily within the egg. 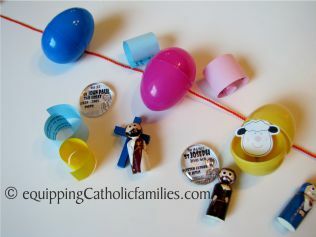 You could scatter a collection of Saints or family member pegs throughout the 50 eggs…or deliberately place the corresponding Saint on their Feast Day egg. Count ahead to special Feastdays coming up. 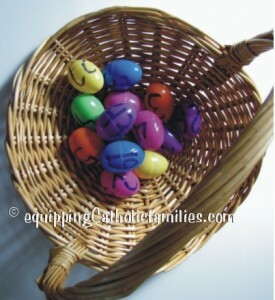 Carefully fill the specially numbered egg with contents reflecting the Saint or the Feast Day! You may want to write the numbers 1-50 on the days of your fridge calendar from Easter Sunday to Pentecost, to make it easier to keep track of the eggs. I see St George, St Mark, St Catherine of Siena, St Joseph the Worker, St Philip and St James, St Dominic, Our Lady of Fatima, St Matthias, St Isidore the Farmer, …all happening before Pentecost Sunday on May 15! Perhaps you have started working on little felt finger puppets…or even just cut out the pieces to be assembled and glued once they are removed from the egg. 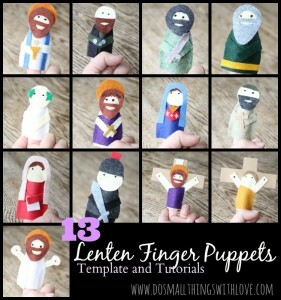 I absolutely LOVE these Lenten Finger Puppets over at Do Small Things with Love! Change it up! Use a combination of treats, activities, Scriptural quotes and prizes so that the contents in each day’s egg is a surprise! Consider using scotch tape to reinforce the seam on the eggs so that only one egg is opened each day! Display the numbered eggs in order on a mantle or jumbled up in a fruit bowl …or string them up! 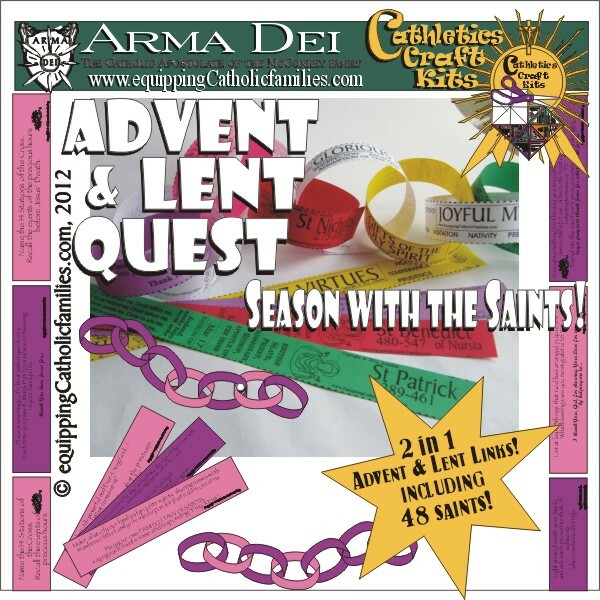 The Calendar Saint Stickies Craft Kit has 461 Catholic stickies of Saints, Feast days and Devotions! Print them on full sheet label paper for DIY stickers or laminate and cut them for Catholic tokens! These are a great addition to the Easter Eggs! Looking for round Saint stickers for poker chip tokens? 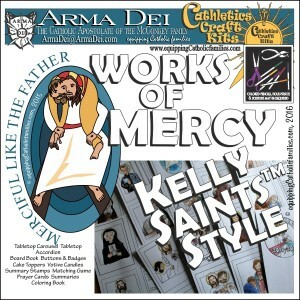 Kelly Saints Stamps convert all your classic family board games to be Catholic with a bunch of different templates and a plethora of ways to use them! 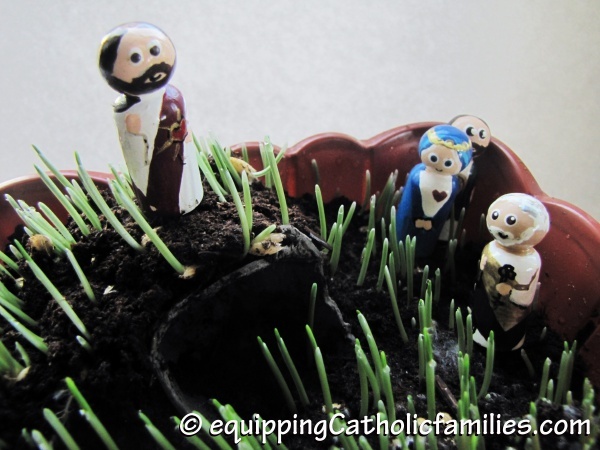 Have you seen our newest Cathletics Craft Kits for this Year of Mercy? 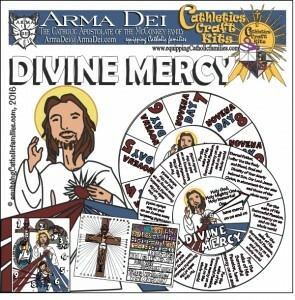 Divine Mercy Craft Kit with lots of templates and lots of ways to use them…not just during this Divine Mercy Novena week counting down to Sunday! The Works of Mercy Craft Kit features Kelly Saints doing the Works of Mercy that they do best! The kit includes little summary stamps that will easily fit in Easter Eggs! What will you fill your Easter Season eggs with? 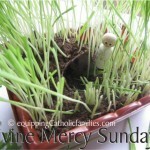 Home Stretch of Lent: Holy Week!